Ullhaul Trailers come with a set of standard features that most other trailer manufacturers would charge you extra for, not only are these features FREE, but they increase the overall trailer appearance and performance. Each trailer is built to tight tolerances and inspected thoroughly to ensure that all quality requirements are met, insuring you the customer that your trailers longevity will surpass most others on the market today. Each of our models comes with a set of self-storing ramps that makes loading and unloading a breeze. You can install the ramps in a few minutes and they store neatly out of the way when your not using them. 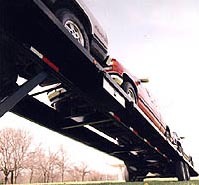 The ramps are made of hi-quality steel and are able to take the weight of even the heaviest loads. Our trailers are made of the finest materials and are welded by certified welders to insure that only the strongest joints are achieved. Along with our patented five degree load angle and heavy continuous rails, your bound to fall in love with it the first time you pull a load. This picture shows how well built our trailers really are. The large rails and cross members ensure that even the biggest loads wont cause excessive stress in the structural members.